Craig Ball: There's more to fortitude than strength in the face of adversity. It's part of the bigger natural order of things. There's more to fortitude than strength in the face of adversity. It's part of the bigger natural order of things. 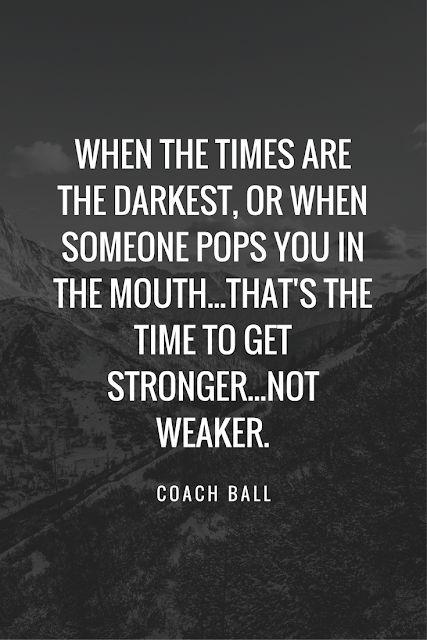 "When the times are the darkest, or when someone pops you in the mouth...that's the time to get stronger...not weaker." My Coaching staff brings a wealth of old-school...real-world experience so you can also find the term "Buck-up" as another one of those calls to action terms that are found located somewhere in the lesson to describe how to summons some added courage when needed. The other day one of my coaches was a little frustrated about what seemed like a lack of something from a few of our players when it came to playing with pain or feeling too sick to go to practice. Fortitude is the word that came to his mind at the moment... and I think the word encompasses much of what we are trying to impart on our young men. After some blank stares, my coach asked all of our players to look up fortitude when they got home and to bring him back a definition of the word for the next day. As I began to reflect on the essentials of fortitude, I started to realize that fortitude was just part of a much bigger natural order of things. Fortitude is only one part of what is known as the Four Natural Virtues, and as we instruct...we must also be aware of the close relationship of the other three natural virtues: Prudence, Justice, and Temperance as it relates to football and the lessons for life in general. Prudence: Avoiding waste and having wisdom in practical matters. We often talk about being efficient in our movements and having no wasted steps...slipping blocks instead of attacking someone who is bigger than us while using our strengths juxtaposed to their weaknesses. As I like to say...being graceful and taking advantage of the situation. Justice: The idea of fairness and being able to appreciate something properly. "Sometimes you need to look at the big picture," is what I was always told...Justice is one of those virtues that has two sides to the lessons. 1) Can you treat those around you with fairness and look at the situation in front of you with proper perspective? Much like understanding speed and strength of your opponent when sizing up someone, and 2) learning that you will not always be treated fairly...the idea that you will always be treated fairly is somewhat of a misguided expectation. The "refs" may seem to make calls against you or you think you should get more playing time are both examples of learning to deal with the virtue of justice...just on the other side. Nobody owes you anything...you have to earn it. Fortitude: A mental strength that allows you to move forward enthusiastically when faced with adversity, force, or some type of temptation. Learning to deal with obstacles or just some force attacking you are both reasonably obvious factors on the football field...but not being tempted to go in the wrong direction (staying home) or to be tempted to stay away from a workout or practice is just as meaningful to the game. Temperance: Moderation and self restraint...staying in disciplined control. As we relate these virtues to football, I've realized that most of my players couldn't give a decent definition of temperance when asked strait-out. It's just not a term that we use much anymore...but when given a little background about what we are teaching...the players can see where it all fits in. Being out of control and lacking discipline on and off the field has no place in football. As we get ready for the next big game or the next seemingly insurmountable obstacle...we can look to the combination of these four football terms for added clarity in times of need...all along knowing that we are on the right path and that we already possess the strength for ultimate success. Comment Section: These four virtues are also called the Four Cardinal Virtues. There are three heavenly graces that are linked to the Cardinal Virtues. 1) What are the three heavenly graces? 2) Who originated this list of virtues? 3) Which of the four natural virtues do you think is your strongest virtue and why?